I love this movie very much! I believe that Myrna Loy played a menacing oriental after this only in: The Mask of Fu Manchu (1932). She was perfect in both. I think she's much better in MASK OF FU MANCHU where she has a sexual-sadist scene that is a lot of fun. Absolutely get the same vibe. It's called Thirteen Women, although I barely remember six or seven ladies shown. Wah! Crime thriller with Jack Kelly as a middle class husband and father of two young children who picks up hitchhiker Vince Edwards, only for Vince and his two compatriots (John Cassavetes and David Cross) to take Kelly hostage, invade his home, terrorize his family, and hold them for a big ransom to be paid by Kelly's rich father. Also featuring Hildy Parks as the scared wife, Jack Kruschen as the chief detective on the case, Eddie Marr, Jonathan Hale, and Barney Phillips. This was a fairly standard picture of the genre, with a Naked City style. Based on a true story, with the real victims shown at the film's start. The character played by Entwistle, that of Hazel Cousins, is a married woman in the film, who kills her husband and goes to prison. In the book, Hazel is a virgin who remains so simply because she is considered too beautiful; men are either too intimidated to approach her, assume she is married or engaged or believe that she will break their heart. Hazel eventually becomes a lesbian after she is seduced by the wife of the doctor treating her for tuberculosis. Hazel starves herself to death in a sanitarium while suffering the heartache of having been abandoned by her lover Martha. In both the book and movie, May and June Raskob (played by Harriet Hagman and Mary Duncan) are twin sisters who work in a circus, but in the book they are overweight side show attractions, rather than photogenic trapeze artists as in the film. I MEAN, THAT SOUNDS LIKE ONE HELL OF A BOOK, HUH? I guess I dont need to read the book now. 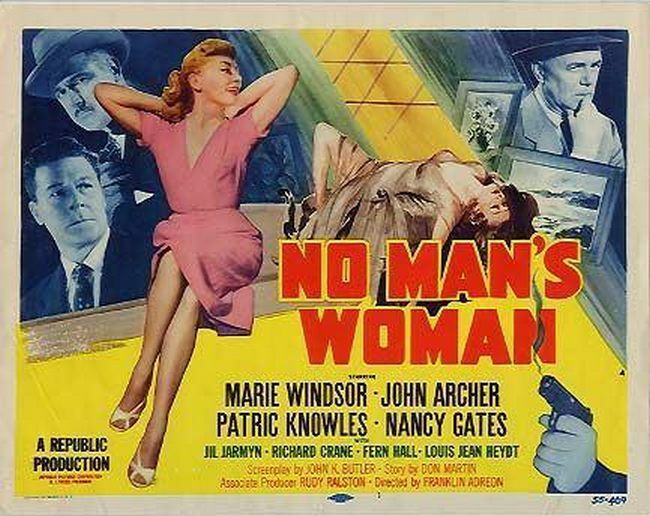 Mystery starring Marie Windsor as a nefarious woman who gets murdered. She betrays and manipulates so many people that the pool of potential culprits is rather large, including Patric Knowles, John Archer, Nancy Gates, Jill Jarmyn, Richard Crane, Douglas Wood, and Fern Hall. Detective Louis Jean Heydt is on the case, while Percy Helton wheedles and whines as a caretaker. Also with Morris Ankrum and Paul Bryar. This plays like an episode of Perry Mason without the later trial part. The 70-minute film spends 40 minutes establishing what a detestable person Windsor is before watching her get killed (not a spoiler), and then the remaining time figuring out which person or persons did the deed. A passable time-waster, with Windsor in top form. oh i didn't mean to spoil anything! i think it's a small part of the plot! SORRY!!!!! Ultra-low-budget crime drama that follows the sad, pathetic life of Cassandra (Barbara Marks), a young woman from a troubled home who falls in with the wrong crowd, a biker gang that soon has her smoking "reefers" and slacking on her school work. She makes a stab at respectability by marrying a nice boy from high school, but soon her "sinister urge" rears its ugly head, and she's back out on the streets, this timed getting hooked on heroin. It isn't long before she's hanging out with felonious Mexican criminal Cholo Martinez (writer-director Bamlet L. Price Jr.). This very minor effort is filled with no-name cast members and was filmed without location sound, so the entire movie is narrated by Kurt Martell. This runs less than hour, and may be of interest to grindhouse aficionados or connoisseurs of the truly bad. Stuff your sorries in a sack, mister! Based on a true story, with the real victims shown at the film's start. Ooh, like The Phenix City Story! I love the bit in The Phenix City Story where the journalist is talking the the janitor and asks if he has a gun to defend himself and if he knows how to use it. They could call the drugs "opioids" and release the same movie today. The 70-minute film spends 40 minutes establishing what a detestable person Windsor is before watching her get killed (not a spoiler), and then the remaining time figuring out which person or persons did the deed. I like movies where EVERYONE wanted to kill the person, so the one who did is actually congratulated! Mild comedy with Charlton Heston as a too-touch, by-the-book Army training officer who, after causing much bad p.r. with a nationally-published interview, is reassigned to head up the ROTC training at a Catholic all-boys military school. His strict discipline and hard drilling tactics cause much unrest among the young students. Benson also tries to romance school doctor Julie Adams. Also featuring William Demarest, Nana Bryant, Sal Mineo, Tim Hovey, Tim Considine, Mary Field, Milburn Stone, and David Janssen. There's some humor in this family film, but I wouldn't go out of my way to see it. From the creators of Leave It to Beaver. 1. Lady Gaga is quite good here, and is very touching really. It's a better performance than I was expecting, I must admit. So it does justice to the earlier versions there. 2. I've seen a lot of movies with a lot of language, but the language level here is distracting on a film whose original was done in 1937. The 1976 version had language too, but not this much, and the material doesn't need it. 3. "Shallow" might not be as good a song as "Evergreen" back in 1976, but it is still a good song and its fantastically cinematic, the highpoint of the film. 7. Andrew Dice Clay gives his second good low-key supporting performance this decade (after Blue Jasmine). Who would have expected it at the beginning of the decade? 8. The story still has its old drawing power. It kid of pulls you along regardless. Like Love Affair/Affair to Remember, it is virtually indestructible. 9. Cooper and Gaga do have great chemistry. 10. End result, a good new version of a classic story, not as good as the three that went before it, but still entertaining, still moving, and a solid 8/10. 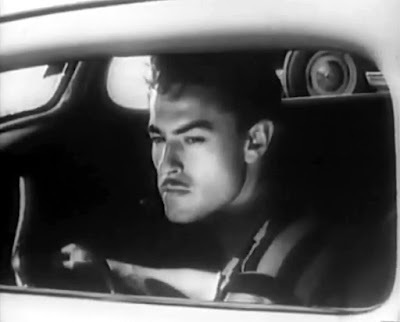 Fun crime picture with William Campbell as an undercover cop trying to infiltrate a stolen-car gang led by gas station operator Keenan Wynn. Featuring Kathleen Case as Wynn's girlfriend who has eyes for Campbell, Jan Merlin as the hot-tempered second-in-command, Mamie Van Doren as "Irma Bean", Walter Coy, Michael Fox, Otto Waldis, and 19-year-old John Saxon in his credited screen debut. This was the first "rock and roll" picture that I've watched this chronological go-round, with a manic dance scene set to "Razzle Dazzle" by Bill Haley and His Comets. 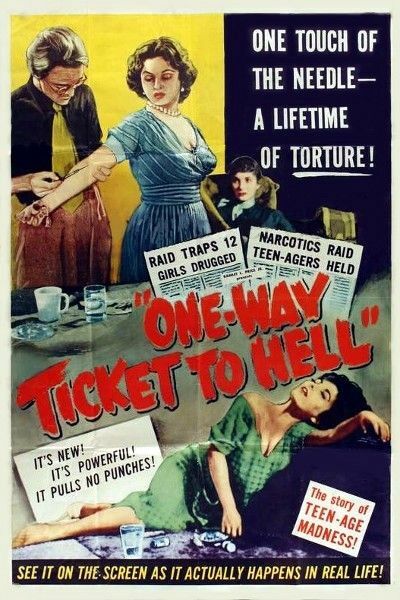 Since you're up to crime movies from 1955, I hope you get a chance to watch Teen-Age Crime Wave. Not particularly good, but a lot of fun. I just watched the 1932 pre-code 13 WOMEN starring Myrna Loy and Irene Dunne. This movie contains the only screen performance of Peg Entwistle, the gal who tragically jumped off the Hollywood sign to her death. Did you know that Peg Entwistle was Brian Keith's stepmother for a few short years in the 1920s? Unnecessary remake of 1939's The Four Feathers, directed by Zoltan Korda and Terence Young. 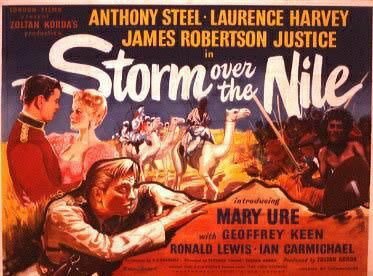 Anthony Steel stars as a British Army officer accused of cowardice by his friends after refusing to ship out to fight in the Sudan. When even his beloved (Mary Ure, very lovely in her movie debut) presents him with the white feather of cowardice, Steel decides to travel to the region on his own, assume the identity of a native, and try and rescue his friends. Also featuring Laurence Harvey, Ronald Lewis, Ian Carmichael, James Robertson Justice, Geoffrey Keen, Michael Hordern, Ferdy Mayne, and Christopher Lee. Korda decided to remake his own previous triumph, and uses the same script and even large chunks of footage from the earlier film. The only differences here are the inferior cast and the use of CinemaScope. This latter achievement was lost on me as the version I had access to was a pan-and-scan copy. Blah. The Karloff/Loy "Mask" was one of William Hearst's attempts at consulting movie projects at Warner, and he reportedly wanted to use a Fu-revives-the-Mongols story to push his anti-Asian "Yellow peril" issues in the press. I literally didn't know he was still alive, until he showed up with the other Whatever-Happened-To has-beens in an early 10's season of "Celebrity Apprentice". Where, surprisingly, he played along with the weekly challenges and didn't seem too much of a jerk, not as nice as Pauly Shore, but easily far above the unrepentant offscreen a-holery of Tom Green and Dennis Rodman. Low-rent crime drama from exploitation king Sam Katzman. Jane (Sue England) is a good-at-heart girl hanging out with the wrong crowd, namely scar-faced Mike (Tommy Cook) and bad-haircut Terry (Molly McCart). When Mike pulls a robbery, Terry and Jane get pinched, and then sent up the river to juvie. However, Mike busts them out along the way to the hoosegow, and the trio hideout at the farm of a kindly old couple, whom Mike and Terry terrorize. Also featuring James Bell and Kay Riehl as the old folks, Frank Griffin as their former-soldier-current-college-student son, Guy Kingsford, Larry Blake, and Damian O'Flynn as the police chief. This starts out promising, but bogs down a bit when the action moves to the farmhouse. It hits all of the hostage-scenario cliches. Mike and Terry are both thoroughly loathsome, so the viewer really anticipates someone shooting them or at least punching them in the face a bunch. My favorite moment in the film may have been the TV news alert on the situation, where they use a picture of Jane in a swimsuit after showing the other two's mugshots.